This list of solitaire card games includes solo games from many different eras. While a complete list would include hundreds and hundreds of variations, the solitaire card games below are some of the more popular ones played around the world. What is a Solitaire Card Game? The very basic definition of solitaire is a card game you play by yourself. Most of these games involve various "tableau" stacks that you build on in different ways. For example, you may start with an ace and need to place other cards on top of it in ascending or descending order. Other types of solitaire games might have you simply clearing cascades while using a main deck. The one thing that solitaire card games don't have in common is how solvable they are. Some are very difficult and others rely on complete random luck to succeed. Solitaire is a relatively new type of card game, discovered in literature around 1780 in a game rule book in Germany. Over the years, solitaire, or patience as it is sometimes known, became more and more popular. Many of the games in this list came about in the late 20th century. The complete list of solitaire card games would fill a book, but here are some of the most popular. Klondike Solitaire - This is the most common solitaire game people know. There are seven columns. Starting with column one, there is one card facing up. From columns two through seven, there will be that column number minus one cards face down and the bottom card face up. For example, in the sixth column, five cards will be face down and the last card face-up. Your goal is to build four discard piles in ascending order starting with the ace. You are allowed to use face up cards from the tableaux, turning the next subsequent card over when you remove the face-up card. From your deck, you can turn over every card (going through the deck once) or every third card (which allows you go through the deck three times). When you clear the tableaux and use all your cards in the deck, you win. Pyramid - Using an entire deck, you stack the cards in a pyramid, with each row slightly covering the row above. The goal is to use any uncovered cards to build foundations. There are also several variations of this game. Captive Queens. This is one of the harder solitaire games. You place the four queens in a circle pointing in different directions and one pair of 5's and 6's near each queen. 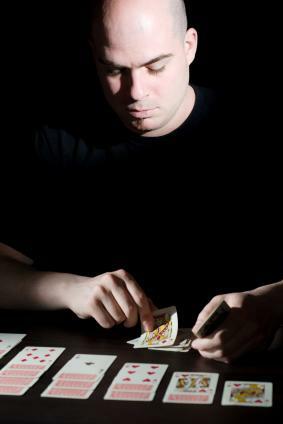 Using the deck, you place other cards in descending order on the 5's and in ascending order on the 6's. Trefoil - Trefoil is one of the hardest solitaire games to win. The base piles are started with the four aces, with 16 tableau piles of three cards each. You must build from the base piles in each suit, completing the piles with kings on top. This game has other names like Alexander the Great, Midnight Oil, The Fan or Three Shuffles. FreeCell - FreeCell is a solitaire game where most of the deals will win. All the cards are dealt face-up. The "cell" part comes in because you can move a card in the tableau to uncover another card you might need for the foundations. It's one of the most popular basic games on computers. Since some solitaire games might have many different names, it's important to pay attention to the rules when you come across a new one. It may be a game you are already familiar with.